On August 28, 1863, the 1st battalion of the 14th R.I. Heavy Artillery (Colored) under Colonel Nelson Viall paraded through Providence on their way to an island in Narragansett Bay. Jamestowners felt the effects of the Civil War, even though battlefields were far away. Confederate cruisers were causing havoc on commerce in the unprotected West Passage of Narragansett Bay. Dutch Island, which commands the western entrance to the bay, was where the 1st Battalion headed to from their training in Providence. They were to assist in the construction of a camp and anti-Conferderate fortifications. On November 19th, with the fortifications nearly complete, Governor James Y. Smith, the RI legislature, and other distinguished guests presented the standard to Colonel Viall at the newly-formed Camp Bailey. "It affords me much pleasure to present to your regiment, our Fourteenth Corps d'Afrique, this flag, and I feel confident that it will be entrusted to as brave men as ever enter the service in our defense of our country and its liberties." Although there was much fanfare at the dedication of Camp Bailey, it's not surprising that Black soldiers faced many forms of discrimination during their service in the Union Army. Most apparent was that Black units were commanded by White officers and had little opportunity for promotion. The issue of pay was also divisive. Initially, enlisted Black men thought that they would receive equal pay, but later found they would receive less per month than White soldiers. Documents show that financial incentives, known as "bounty," used to increase enlistment, were rampant with fraud. Racist attitudes, coupled with illiteracy among many Black recruits, led to exploitative documents being "willingly" signed by Black soldiers. Most cases of deceit involved the deduction of expenses for worthless items and bounty never being paid. This corrupt behavior by recruiting officers wasn't rectified until testimonies of soldiers, including those of Privates Calvin Bailey, George Gordon, and John Dorsey from Camp Bailey, were given in a hearing to the House of Representatives in 1864. In the winter of 1863-1864, units from Camp Bailey began to leave for Texas and Louisiana. The Providence Journal specifically named three of the Black soldiers: Charles Freeman, Peter Freeman, and Jeremiah Noka. Only Peter Freeman survived. Although the 14th R.I. Heavy Artillery was mustered out on October 2, 1865, Dutch Island, almost deserted, remained an official outpost until 1897. At the time, an ambitious round of coastal defense construction had already begun at Ft. Greble. Union Recruiting Poster c. 1863: The Confiscation Act of 1862 freed enslaved individuals whose owners were in rebellion against the United States. The Act, coupled with the Emancipation Proclamation then empowered formerly-enslaved individuals, as well as previously-free Black men, to join the Union Army. 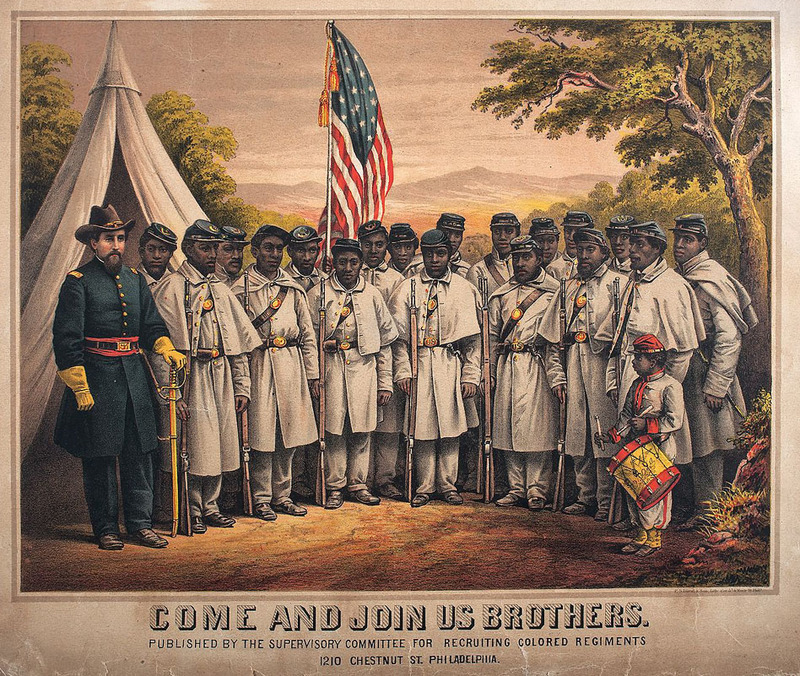 Recruitment of "Colored" regiments began and the Bureau of Colored Troops was formed to facilitate the recruitment of Black soldiers to fight for the Union. Carte de Visite of John Sharper, c. 1863: John Sharper was a member of 14th R.I. Heavy Artillery Regiment and a printer by trade. He signed his own enlistment papers. 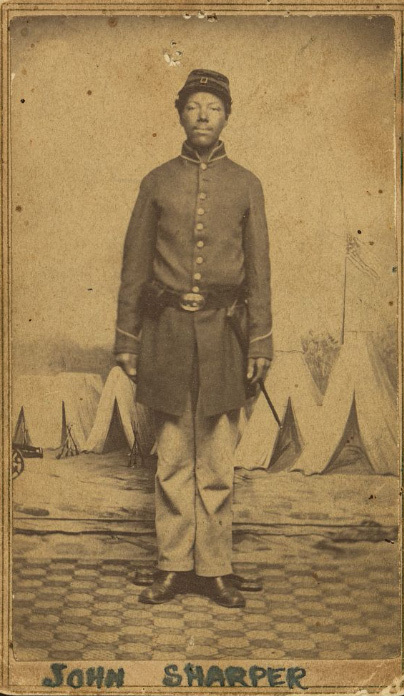 During the time period, carte de visite were especially meaningful to Black families as living proof their soldier had been recognized as a citizen and soldier of the United States. Civil War Cemetery: In the foreground of this image, you can just see the markers for 16 Black soldiers who died during an outbreak of smallpox during the construction of Camp Bailey. The buildings in the background are c. 1901. In 1948, the remains of these men were moved and reinterred at the Long Island National Cemetery. 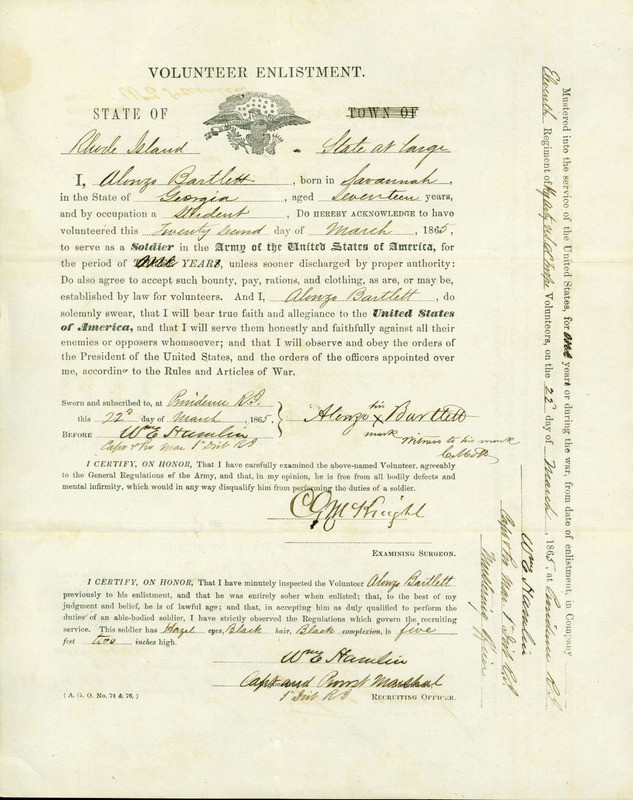 1865 Volunteer Enlistment Paper: It was common for many soldiers who couldn't read or write to have someone else fill out their enlistment papers. Notice this soldier's "mark" over his name. If you're interested in learning more about what happened to the 14th R.I. Heavy Artillery after they left Dutch Island, visit this link. Here is a link to testimonials of Black soldiers who had been cheated of their bounty. 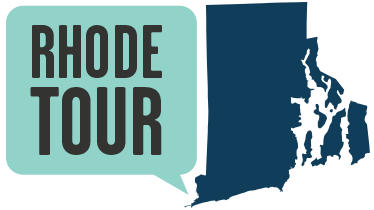 Jamestown Historical Society, “Camp Bailey on Dutch Island,” Rhode Tour, accessed April 21, 2019, http://rhodetour.org/items/show/288. Chenery, William H, The Fourteenth Regiment Rhode Island Heavy Artillery (Colored) in the War to Preserve the Union, 1861-1865. Providence, Snow & Farnham.